In our overly-refined, limited vegetable and fruit intake diets, few of us come close to consuming the recommended 25-35 grams of fiber daily. Intestinal Tone makes it easy to fill in the fiber gaps. It contains five grams of fiber per serving, made from the highest grade of all-natural psyllium, which is considered one of the best sources of both soluble and insoluble fiber on earth. 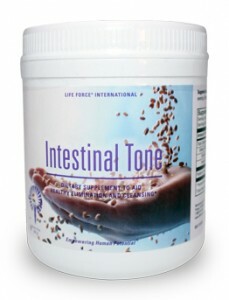 Intestinal Tone contains no chemical stimulants, sugar, salt or preservatives. Intestinal Tone can be used alone, or as part of our Colon Cleanse Program.